My name is Marc St.Hilaire and I’m the newest member of the AU Career Center. I’ll be working with graduate students within SIS alongside John Charles, so I’m looking forward to meeting with you all either one on one or during drop-in hours at the SIS atrium. So how does one combine their passion with that inevitable need to make an income? The answer: It’s all about the small steps. Whether you’re being paid to do something you love or taking steps to eventually get there, keep at it because these activities will enable you to work at your peak. In a recent article in the Harvard Business Review entitled “Choosing Between Making Money and Doing What You Love,” the authors – Leonard A. Schlesinger, Charles F. Kiefer and Paul B. Brown – state ” You simply want to be doing something that you love, or something that is logically going to lead to something you love, in order to do your best work. That desire will make you more creative and more resourceful, help you get further faster, and help you persist”. So get out there and follow your passion, the bills will get paid sooner or later. 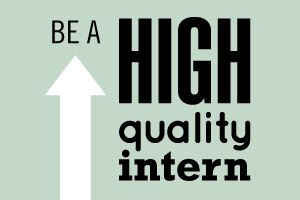 Prepare for a High Quality Internship for next semester now. We posted new and improved resources on our website including internship details, intern blogs, and search options for your future internship. We also added new features! We revamped our internship maps, adding helpful information. Our new High Quality Internship map displays past and current internship locations. Sites with a golden yellow placemark include student success stories, student advice, videos, internship descriptions, and ways to find an internship with that location. And now, we’re Tumbling intern advice.The Tumblr features illustrated advice from fellow students. Explore illustrated advice from fellow students. You can follow updates with a Tumblr account, subscribe to updates with RSS, or check back to see regular updates. If you want to share your own advice or have suggestions for a High Quality Internship, email fblume@american.edu.